Bees have been part of the human community since the days of prehistory. Cave paintings created by Neolithic people in Spain from between 6000 and 8000 BC show them gathering honey from wild bee colonies. The earliest record of beekeeping in human-made hives dates back to Egypt of 2400 BC. Bees themselves have been around for even longer than their association with humans. The oldest bee fossil was found in Myanmar enclosed in amber. It is 100 million years old. Worldwide, Bee is a symbol of good luck, abundance, hard work and community. The ancients believed that the bees’ ability to make honey was a gift from the divine. Bees who give us their sweet honey – used for food, drink and medicine – are found in myth and story all around the world. The Greeks, who knew only how to collect wild honey, inherited bee keeping from the Minoans, who worked with and honored bees since the beginning of the Neolithic era. 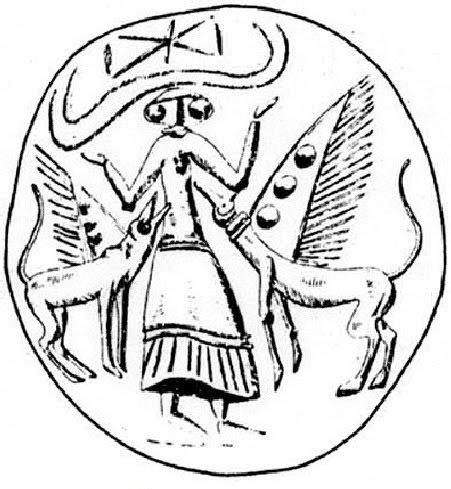 The Great Mother Goddess was often called “Melissa”, meaning “the Queen Bee.” In the myth and imagery of both cultures, associations of the Mother Goddess with the little honeybee are abundant. The ancient Greeks also believed that bees were connected to the souls of the dead as they often made their hives in caves which were said to be the gateway to the underworld. India’s ancient sacred text, the Rig-Veda, contains numerous references to bees and honey. 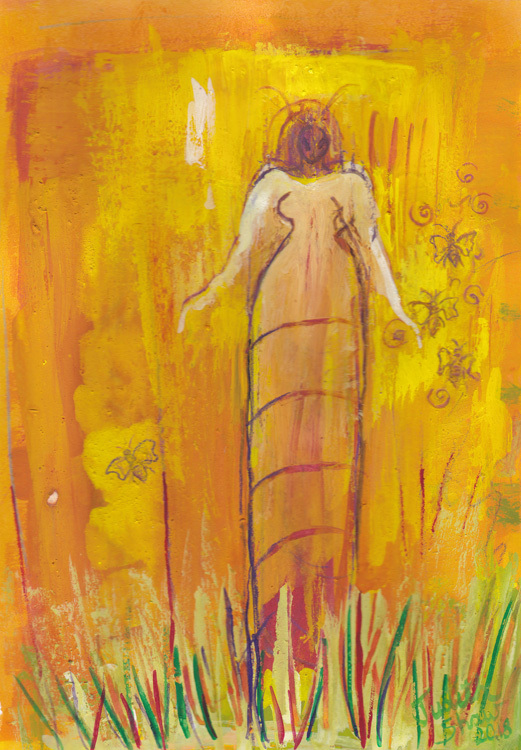 The Indian Bee Goddess, Bhramari Devi, whose name comes from the Hindi word bramari, meaning ‘bees’, is said to make her home within the heart chakra. Here she emits the buzzing sound of bees. All across ancient India the humming of bees represented the essential sound of the universe. To the ancient Celts bees were viewed as beings of great wisdom – messengers with the ability to travel to the Otherworld and bring back messages from the gods. The Scottish Celts of the western isles believed that bees reflect the knowledge of the druids. Highlanders believed that a person’s soul would leave the body in the form of a bee while sleeping or in a trance. These ancient beliefs show the relationship between Bee and Inspiration. 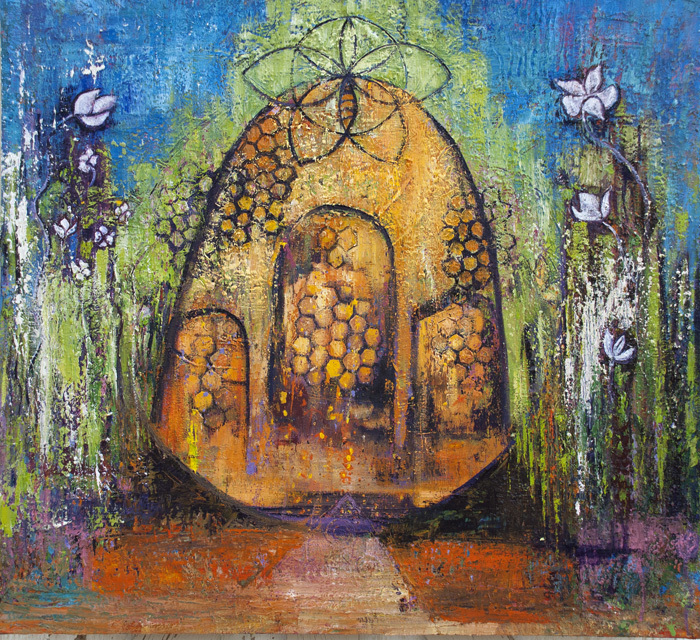 Bee calls you to be open to messages from the spirit world. Through Bee’s association with souls and their skill as messengers between the worlds Bee might be bringing you divine messages. When Bee appears let divine inspiration flow into and influence your life. Bees are also sacred to the Celtic Goddess Brigid. The Celts believed that bees and their sweet nectar came to Earth from Brigid’s apple orchard in the Otherworld. Attributes that are very important to consider when Bee appears to guide you are Hard Work/Productivity and Community. Bee speaks of focused energy. Hear Bee’s call to keep everything in order and everything will fall into place. A bee colony is made up of one Queen, tens of thousands of female worker bees and several hundred male drones. The Queen only leaves the hive once in her life which can last for up to five years. During her first spring of life she takes her “maiden voyage” in which her goal is to be impregnated by as many drones from other hives as possible. She returns to spend the rest of her life in the hive, cared for by the worker bees, as she lays millions of eggs – an average of 1500 per day and up to 2500 a day in the busy summer months. The female worker bees, who live for about six weeks, do all the work. We’ve all heard the expression “busy as a bee.” They are diligent workers, focused on their many ongoing tasks. A single foraging honey bee flies up to 1.3 miles a day. They collect nectar and pollen to nourish themselves and their young. This process not only provides for the bee colony but also pollinates many flowering plants, allowing them to produce fruits,vegetables and seeds, which in turn nourishes our human community. The male drone’s only purpose is to impregnate a queen from another colony. They live for up to four months and are never allowing to survive the winter in the hive. Not all drones get to mate but the ones that do die in the act of mating. The honey bee, originally from Europe and now in North America, can have colonies comprised of over 60,000 individuals. But the colony really exists as a community. No one individual could survive alone. And their community is based on hard work and productivity. When Sweet Honey Bee calls your name take a moment to look at your own work ethic and productivity. Now is the time to focus your energy and work hard to reach your goals. Bee also calls you to remember that you are part of a community. It is not the time for rugged individualism; it is time to recognize that your strength lies partly in connection and community. Another important aspect symbolized by Bee is communication. Honey bees communicate with each other by dancing. It’s called the Waggle Dance. With their figure 8 dancing movements they are able to communicate the exact location of a new food source. When Bee appears to you consider how well you are communicating your thoughts and ideas. Use your skills of communication to help reach your goals. In addition bees do not like loud noises, quarreling or arguments. Remember that as you communicate – speak softly and seek a positive resolution for all. Bees also symbolize good luck, abundance and prosperity. All your hard work and community life produces abundance. Take the time to enjoy the pleasures that life brings. Feel the sweetness of abundance and prosperity and let your stresses melt away. When Bee calls to you know that it’s time to find your focus and commit energy to productive hard work and effective communication, allowing abundance and prosperity into your life. Be open to messages from the spirit world and to divine inspiration. May the little golden, buzzing bees bring you the blessings of hard work rewarded, community and inspiration. Judith Shaw, a graduate of the San Francisco Art Institute, has been interested in myth, culture and mystical studies all her life. 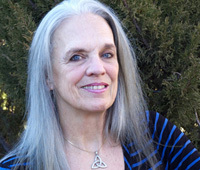 Not long after graduating from SFAI, while living in Greece, Judith began exploring the Goddess in her art. She continues to be inspired by the Goddess in all of Her manifestations. In recent years Judith became very interested in the Goddesses of her own ancestors, the Celts. She is now working on her next deck of oracle cards – Animal Guides. Originally from New Orleans, Judith makes her home in New Mexico where she paints as much as time allows and sells real estate part-time. Give yourself the gift of one of Judith’s prints or paintings, priced from $25 – $3000. I love your paintings! I deliberately plants bee friendly flowers to attract bees of all kinds. Colony collapse disorder has devestated out honey bee population so it’s doubly important to attract other bees like bumblebees who are actually more effective pollinantors. I also plant bee friendly flowers. 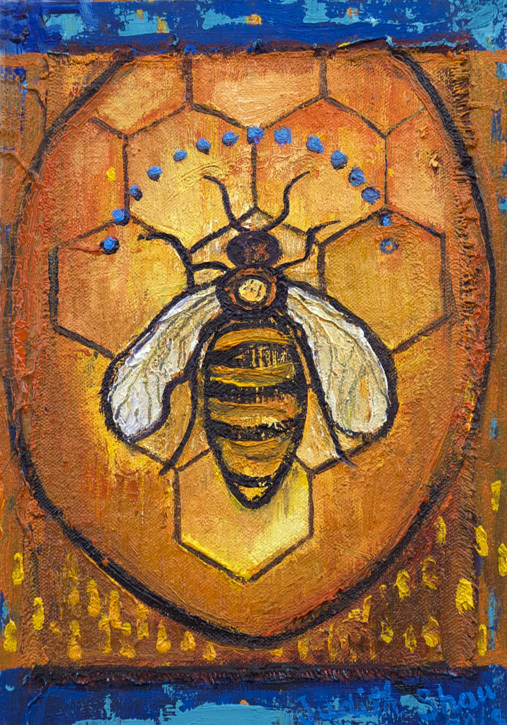 I started painting bees and the Bee Goddess back in 2010 when I first heard about colony collapse disorder. This is the first year I haven’t had a hive since 2012 and I do miss seeing those little golden creatures flying around my back yard. But others is the neighborhood keep bees so there are still plenty to pollinate my garden. I learned from my research that the bumblebee is very gentle and lives alone. They don’t even have stingers (if I’m remembering correctly). I have a couple who love my red salvia plant. And all the flying beings love the sunflowers!! Here in New Mexico we still have honey bees but colony collapse disorder is taking a toll in Texas so who knows for how long. Indigenous peoples still sell honey without anitbiotics from these bees – and yes, bumblebees live more soliaritary lives … everyone loves the red salvia – next year I’m going to have more of it and more bee plants too – oh yes nastursiums are another favorite flower and pentstemon too – the front of my house has a hummingbird, be,e hummingbird bee moth, butterfly, garden just for them! Sara, We do have relatively healthy bee populations here in New Mexico though most beekeepers report it’s getting harder to maintain their hives. I’ve heard speculation that maybe because we don’t have as much huge industrial agricultural operations here that the foraging for the bees is a bit less toxic than in states with big industrial agriculture and their use of toxic chemicals. As we will’t, so mote it, Bees. Such a lovely invocation and thanks for the info on the meaning of “Melissa”. When I harvest and then eat the honey from my now empty hive it always feels like a spiritual experience – those little flying beings from their visits to my garden transformed the nectar into honey with their own bodies and shared it with me (although reluctantly). Thanks Karen – hopefully the more people hear about the plight of the honey bee and in fact many, many other insects too the better – perhaps with knowledge folks will stop the use of the pesticides that are destroying so much life. Struggling to support bee life here, as so many have disappeared. Thank you for your images and stories Judith. If we are appreciative, perhaps we can help restore the colonies. I think you’ve hit the mark Barbara – we need feelings of appreciation and gratitude for the wonder of the natural world to become more prevalent than the need for more and more material goods. May awe and wonder reign supreme in the human heart! Beautiful, fascinating post, Judith, and gorgeous paintings! My husband has kept bees for almost forty years. It used to be a simpler more straightforward task. Now the bees need a lot more care and feeding, literal feeding sometimes. He belongs to a local beekeeping society and brings back amazing information from each meeting. The small beekeepers and bees working together are the hope for their continuing life. One thing my husband noticed years ago that has always stayed with me is that each hive has a distinct personality. The hive is the entity and all the bees are part of this being. Made me ponder ourselves/our bodies and our communities in a new way. As for the worker bees, in their little life span they apparently go from cleaning up after their own hatching, to tending new hatchlings (several other jobs in between) and near the end of their lives, they become the scouts. I loved the video of the bee dance as their way of communicating what’s in bloom where. Our sunflowers are blooming now and what a thrilling sight to see bees at their heart gathering sweetness and sustenance. Elizabeth, I had the exact same feeling once I started keeping bees – reflections on individuality and community – our bodies being made up of many, many individual cells which together create ourselves, ourselves creating the community we live in, the communities creating larger groups and so on. And it’s true what you say about the worker bees. They basically do everything except lay the eggs and of course impregnate other queens. They create the honeycombs from their own bodies, they guard and clean the hive, the feed and nurture the larvae and care for the new hatchlings, they forage and they create honey and royal jelly. What a tremendous amount of work they pack into their short lives! I unfortunately had to let beekeeping go this year as I simply don’t have the time to maintain a healthy colony. My bees from last year did not make it through the winter and I think my lack of tending to them last year was part of the reason. I really miss having them around. Judith, I am so sorry for your loss. I know how sad it is when a hive doesn’t winter over. And the task of tending is much more involved now. Lucky you and lucky bees to have been part of each other’s lives. 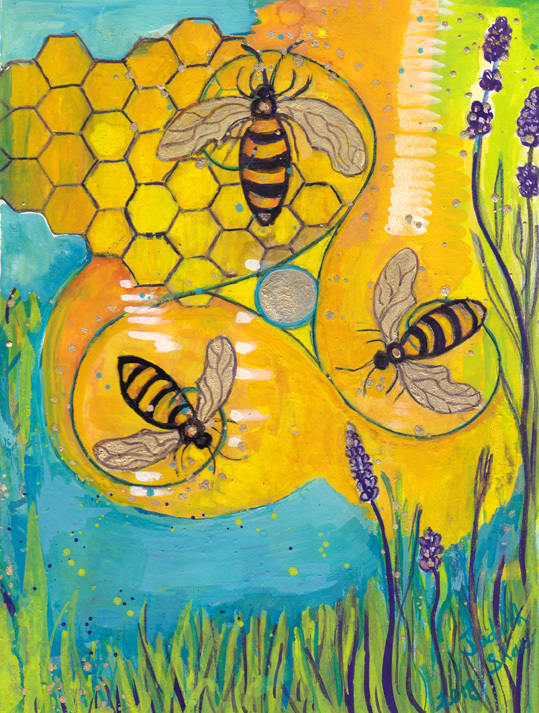 Your bee paintings shimmer with beauty. Blessed Bee!